So the boss attends a financial services event, hears that LinkedIn and Twitter are really valuable platforms to be on, and comes back to the office asking you to get the practice more established on social media. Now it’s your job as the Marketing Manager of the firm to launch the business on social media, and the thing is, you’re just not sure where to begin. 1 Will Social Work for “Boring” Industies? Will Social Work for “Boring” Industies? It’s an all too common scenario being played out in Accountants, Solicitors, and Insurance Brokers the world over; especially at this time of year when summer is approaching and things on the outside can get a little quieter. Brightspark Consulting, one of the longest established digital marketing agency in Dublin, has been working with firms in the financial services sector to deliver and implement B2B social media strategies, they also offer great social media training. Here’s a plan of action you can follow. Your financial services business has knowledge that is valuable to a particular group of people. Whether it is how to run a successful audit, to the latest legislation governing CGT. The trick is to package that up and get it out there to the exact group of people who need to hear it from you. What you need to do is sit down with your team and identify the target personas of who buys from you, and where do they hang out online. What kind of information do they wish to receive from you? 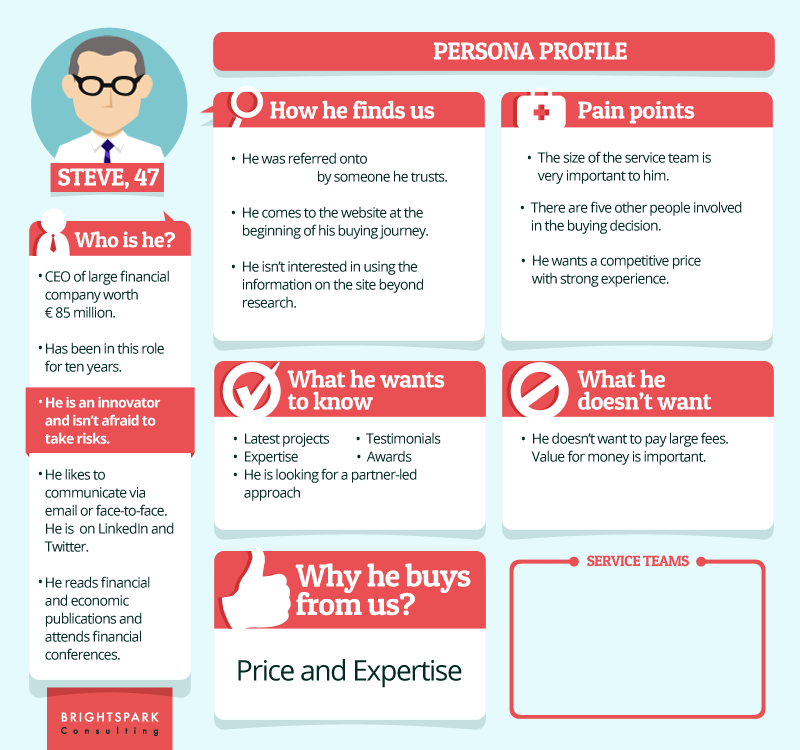 Here are some good questions to ask when preparing B2B buyer personas. When you’re very clear on who you are marketing to, it becomes quite easy to move on to the next stage which is identifying the platforms that you are going to engage on. Remember that the role of a journalist is to fill column inches, so don’t believe everything you read about being on Instagram, Snapchat, and Pinterest. The fact is for a B2B business in the financial sector, it’s more likely that you should be active on Twitter, LinkedIn Slideshare, and possibly Quora. Once you’ve identified which platforms you wish to engage in, the next step is to get your social assets ready. Create your accounts if you haven’t already got one and design up some really nice images that will evoke the brand of your financial services company. Create an attractive Twitter avatar which needs to be possibly your logo, but must be something that’ll work well when reduced to a tiny size. Remember the avatar is the image that people will engage with the most, so pay attention to this. On LinkedIn, I believe that LinkedIn company pages are dead unless you’re a large global enterprise engaged in the business of recruitment. But how to succeed on LinkedIn is with profiles. I’ve written extensively on how to do a good LinkedIn profile. Bonus LinkedIn tip: always use your personal email! LinkedIn Pulse is an extremely effective way of getting messages out to your target audience so for a financial services company it might be a good idea to concentrate on promoting Partners or Senior Managers as thought leaders on LinkedIn via their profiles. When you are starting out, you can use Excel or Google sheets for your content planning. You don’t need to invest in a tool until your content planning becomes busy and you are a perhaps having multiple people in your team working on producing content. That’s when it becomes a good idea to use a content planning tool. I believe that a good first social media goal needs to be around content; set a goal to publish content frequently and see if you can stick to it. Run with a publishing goal for the first 3 to 6 months to see if you can adjust to becoming a publishing house and to translating your ideas into visually compelling content. When it comes to social media today, you must be using video and image content. What day and time of day works best – tip: try publishing posts on a Sunday evening! A lot of the US research says that those times are getting very good traction now because people are using are preparing for the week ahead. While you’re at it, it’s a good idea to start measuring time and to discover how long it takes you to write a blog post, create an image, schedule, and look after engagement with the people who react to your work. You need to know this so you can go back to your boss after an initial period and report on what you are doing, and how long it takes. Creating content for social media takes a good deal of time which is why many financial services companies engage outside consultants such as Brightspark Consulting to manage to social media for them. This can be more cost effective and frees you up to do what you do well. The next stage of social media management is much more exciting because it involves moving beyond simply publishing one-way messages and involves using the social media platforms to reach out to specific target audiences, and engage with them. >Use the powerful targeting options for advertising on Twitter, LinkedIn, Google AdWords, Facebook, and Instagram to reach out to your desired target audience and to drive those people to a dedicated landing page. Your landing page should have an offer and secure an email, which will then enable you in securing an email and then using marketing automation tools to begin a relationship with the target through their inbox. Email Marketing is not dead – it is alive and well and driven by social media! Another exciting way of using social media is to engage with influencers and to get them to use their extensive digital networks to propel your message and your brand. The whole area of influencer marketing is going through a bit of a shake up right now due to the recent legislation governing disclosure. Follow these steps for your financial services social media marketing and you will save time, avoid the mistakes of many of your peers might be making, and importantly look good to your boss. If you achieve your goals and are successful at putting your financial services business out there on social, maybe it’s time you ask for a pay rise!